You’ll give up looking for a job it can’t handle. 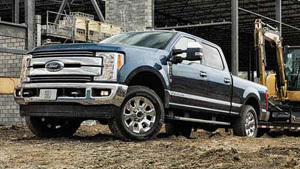 The 2019 Ford Super Duty F-350 proves that the best can get even better. It continues to drive its class forward with high horsepower (gasoline + diesel engines) and torque (diesel). Those who want something that’s just a bit more posh will appreciate the F-350 Limited, which sets the bar for luxury pickups everywhere. Depending on your hauling and payload requirements, you can choose from a F-350 with single rear wheels (SRW) or dual rear wheels (DRW). Whatever your job entails, there is a 2019 Super Duty Pickup that will roll over it and get it done. With a range of standard convenience features, it makes towing a trailer safer and easier–something essential for the twisting terrain in BC. Drive the heavyweight pickup that can’t be stopped. Drop by your Magnuson Ford truck dealership in Abbotsford to see the heavy duty Ford trucks we have on the lot, or browse our inventory online and come in to test-drive a model that appeals to you. We’re just a short drive from Langley, Surrey, Mission, and Chilliwack, British Columbia. Don’t settle for a lightweight when you need a Super Duty! 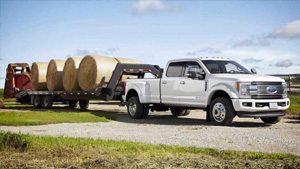 The Super Duty’s available 6.7L Power Stroke Diesel engine shells out 935 lb-ft of torque and 450 horsepower. That best-in-class towing capability means you get the kind of power which moves mountains. This makes the Super Duty the logical choice for contractors, business owners, and anyone who just won’t settle for second-best. The large turbocharger and revised fuel pump give the Super Duty even better response and precision. Did we mention the fuel economy? Miles per gallon are an important consideration if you’re looking at total cost of ownership. When it comes to power and fuel efficiency, the Super Duty is the best of both worlds. Your workplace may be tough, but you deserve an interior where you can get comfortable. The Super Duty does more than support you with comfortable seating. It also takes a load off your mind with intelligent features like SYNC and FordPass™ Connect which keep you connected on the road and integrate with your mobile devices. This means you can keep your hands on the wheel, eyes on the road, and head on the job. Of course, you could also just relax to some tunes. Just say “Bluetooth audio” and listen to what’s on your phone. You deserve a break! A brick wall probably wouldn’t stand up. The Ford Super Duty may be big, powerful, and weighty, but that doesn’t mean it sacrifices on safety. In addition to features like standard Front and Side Curtain Airbags, the Super Duty is built with a super-high-strength frame with a staggering yield strength of 36,000 psi. 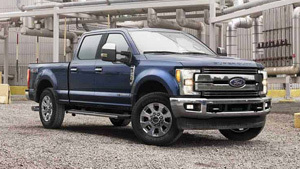 You can also prevent incidents in the first place with LED warning strobe lights, while features like standard AdvanceTrac with Roll Stability Control automatically helps keep your F-350 in check when the going gets tough. Not enough chrome? We can fix that. Drop by our automotive parts department to see our F-350 truck parts and accessories, from flashy exterior additions to essential towing kits to make your hauling easier. Order your F-350 truck parts online and we’ll let you know when they’re ready for pick up.